The Competition, conducted annually, is a significant event which communicates the value and growing popularity of Cypriot wines. It received extensive media coverage in the past and proved to be beneficial in creating awareness of the upgraded quality and the new accomplishments of Cypriot wine producers. The Competition was seen as a cornerstone of the emerging new era of Cyprus wines. It provides a challenge to the local wine makers and a mean to enhance the competitive performance of the sector, whereas at the same time it stipulates the awareness of the quality advances in wine-making during the last years. As international trends and needs have changed, the Cyprus wine industry began to evolve. The process has been slow but steady. 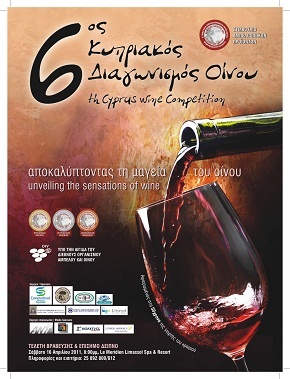 The 6th Cyprus Wine Competition, was held in Limassol, Cyprus, between the 13th and 16th of April, 2011. The tasting procedure will take place between the 13th and 15th of April. On the 16th of April, we had the official award ceremony during a gala dinner. The 6th Cyprus Wine Competition, being of high international standards,was held under the patronage of the OIV (International Organization of Vine and Wine), alike with prior year competitions. The jury comprised highly qualified world class wine professionals, representing different wine regions and countries. Menu adapted to the Cypriot cuisine in cooperation with the hotel Le Meridien Limassol Spa & Resort, the Cyprus Chefs Association and the Cyprus Sommelier Association.